This product is temporarily out of stock. The Yamaha YM2413B-F FM chips are no longer available. New version pending. Installs inside a Sega Master System or Master System 2 console. Hear FM sound on supported games. Installation requires soldering. More info and installation instructions at http://etim.ned.au/smsfm/smsfm.html. 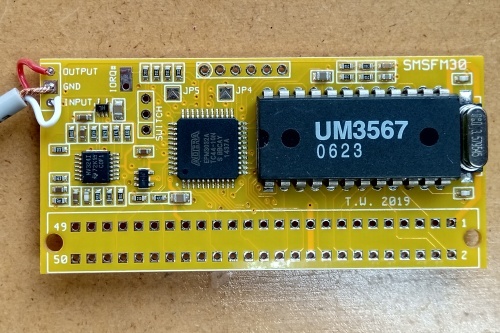 This board is now supplied in kit form. This means the card edge connector and on/off/language switch are supplied loose instead of being pre-soldered. The change was made to reduce size and cost. Sale Price: AU$60.00 You Save: AU$10.00 (14.29%)!